As the pace of 21st century life continues to increase, so too do the expectations of customers. They want informed answers to their queries, and they want them now. To meet these expectations, planners and managers need to be empowered with tools that let them efficiently analyze, discover problem areas and improve overall contact-center service standards. 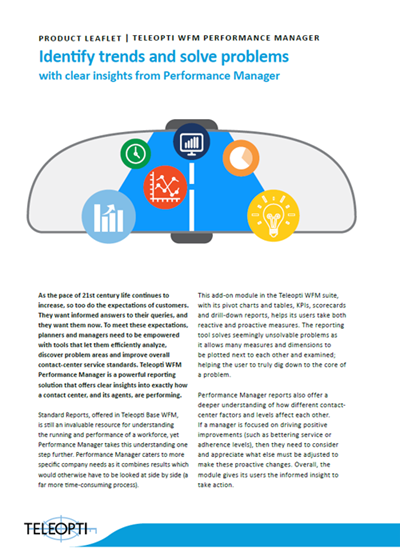 Teleopti WFM Performance Manager is a powerful reporting solution that offers clear insights into exactly how a contact center, and its agents, are performing. Interested in the benefits you’d find with Performance Manager? Read on.